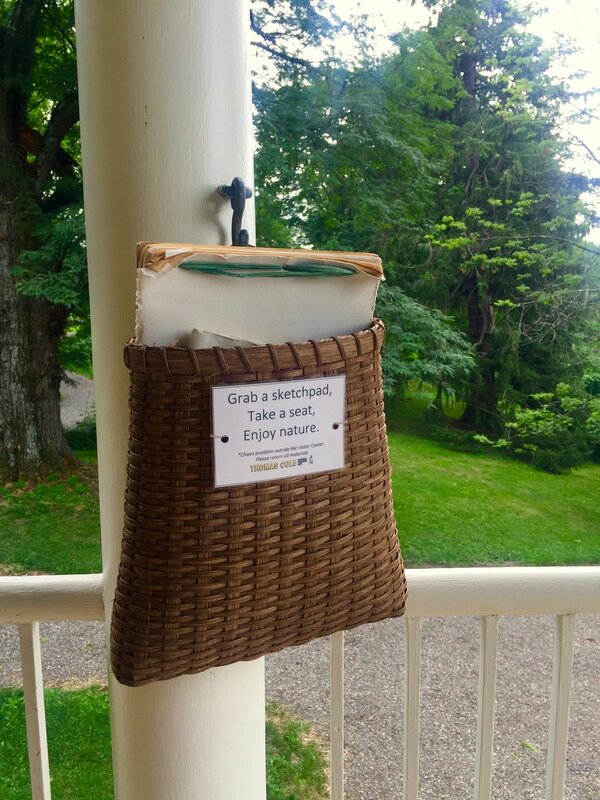 Ramona, pictured above on Thomas Cole's porch, was delighted by the kid-friendly pamphlet that explained how paint was made in Thomas Cole's time. 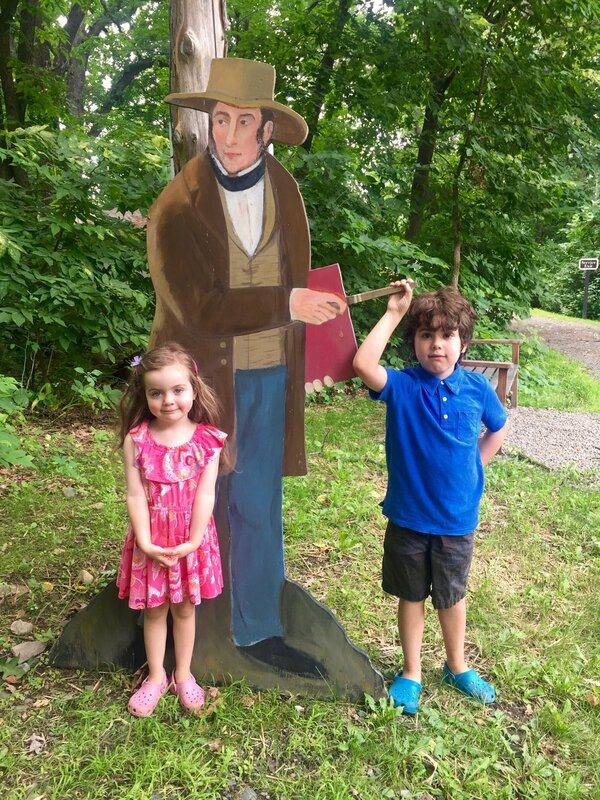 However, let's be real here: This 4-year-old burgeoning artist did not fully appreciate the birthplace of American art. She wouldn't have made it through the hour-long guided tour and didn't care about the paintings. Still, the site has a lot to offer for little people with short attention spans. For instance, she and Archer, her 7-year-old brother, were both very interested in Cole's classy outhouse. And both enjoyed showing off their Art-Appreciation Faces with the wooden cut-out of Thomas Cole. We were all happy to find the outdoor drawing areas, which are equipped with paper and pencils. We're a family that spends a lot of time drawing together, and it felt really special to sit out in nature and draw right in the place where the Hudson River School of landscape painting began. In a small, on-site gallery, a few Thomas Cole paintings are on display in gilded frames. The landscapes are so expansive, so breathtaking, so rich with color and detail. The paintings sing the songs of an earlier time, but the scenes are familiar to anyone who has spent time in a modern-day, unspoiled Catskills forest. In the gift shop, tote bags are emblazoned with the slogan, "We Are Still In Eden," and when you're looking at these paintings, this really does ring true. Now, not every 7-year-old kid is going to get as excited about landscape paintings as Archer, but these majestic works do have a playful, magical spirit that some kids could really get into. We looked closely at Thomas Cole's Italian Scene Composition, painted in 1833, and zoomed in on a tiny detail, pictured below. Might this be a self-portrait of Thomas Cole, with a goat about to eat his red jacket? Will the goat knock his top hat into the water? While Archer and I pondered the paintings, Ramona was more interested in exploring the grassy grounds. Both kids were curious about the big yellow house where Thomas Cole lived. 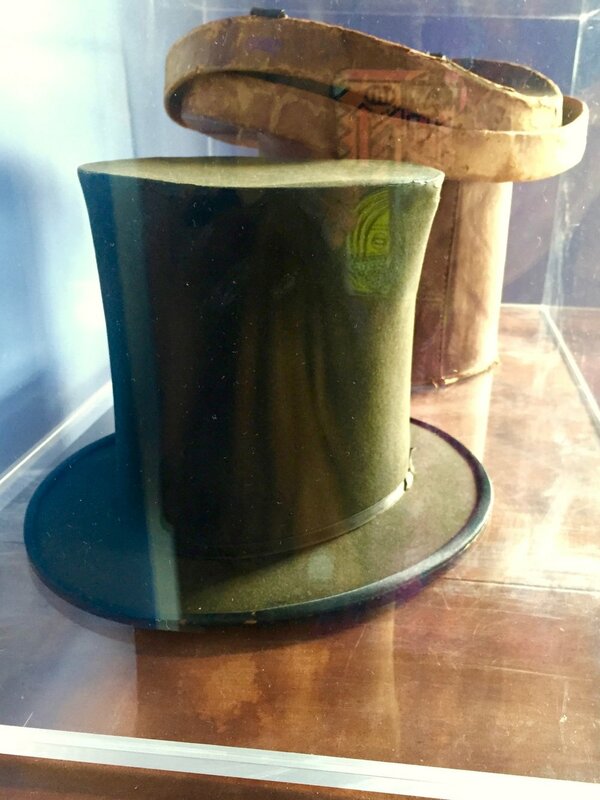 Archer really wishes that top hats would come back into fashion (#stylegoals), so we were all pretty excited to spot a straw top hat hanging from a hook in the foyer, and a glass case housing Cole's actual top hat, along with a well-worn leather travel case. 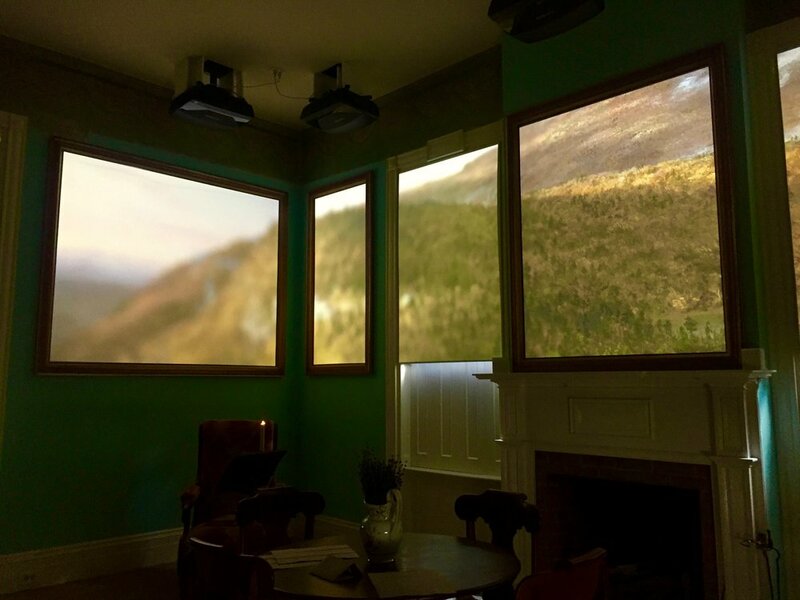 And I just loved it when the window shades and frames in the sitting room turned into movie screens. Such a smart, modern use of a traditional space. It really made the old house feel alive. Archer would've very much liked to break the rules and touch all of Cole's furniture, but fortunately, there were enough hands-on tables to keep the kids itchy little fingers busy. They especially enjoyed playing with a mortar and pestle, similar to the one Cole would've used to grind the pigments for his paint. Though it's hard to fully capture in a photo, the view of the mountains from Thomas Cole's porch is so inspiring, at least for the elder 3 of us. Little Ramona was far more enchanted by the little garden bursting with hot pink echinacea. The Thomas Cole National Historic Site is located at 218 Spring Street in Catskill, NY; 518.943.7465. Hours vary by month, and you can see the full schedule here. The grounds are open free of charge from dawn to dusk every day. General admission is $14 per adult visitor, whether you're taking a guided tour or exploring on your own. Admission for kids under 16 is free.